Apple and it’s new iPad have been in for a bit of a kicking since the launch of the device last month. While most owners of the latest and greatest tablet seem happy, with no faults to report, message boards and technology blogs have been full of issues. First we had the claimed issue where devices were getting abnormally hot during use, leading some clever people to take to their math books in order to compare the tablet with its older brothers. Yes it gets warmer, but hot? The latest perceived issue revolves around the Wi-Fi reception of the new iPad – and interestingly it only affects those machines without a 4G radio in them. Reports of poor Wi-Fi speeds and, in some cases an inability to connect at all has left Apple’s own support forums full of threads from people with all kinds of Wi-Fi related ills. Interestingly, and perhaps uncharacteristically, Apple has decided to take action. 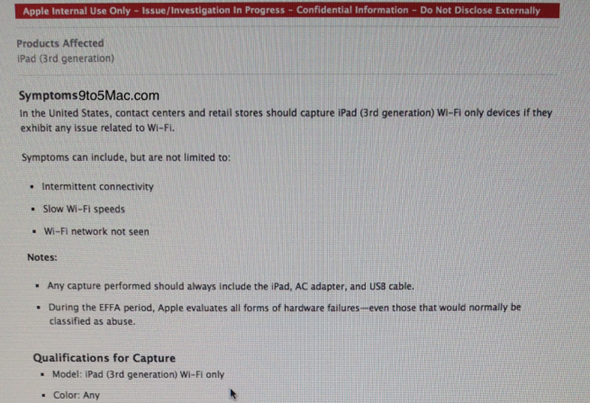 According to a leaked internal memo discovered by 9to5Mac, Apple Stores in the United States are being told to exchange faulty devices and then to send them in for testing. Apple, it seems, believes there is indeed a real issue here. If you happen to live outside the US, though, you may be out of luck. That aforementioned memo singles out the States, with no mention of any sort of international policy. The news that new iPads are suffering Wi-Fi issues may come as no surprise. The original iPad in particular was dogged by accusations of poor Wi-Fi performance – accusations that eventually died down. We are also interested to hear that those iPads equipped with 4G do not appear to suffer any Wi-Fi issues. Is it possible that Apple uses two different kinds of Wi-Fi chips, with one being for Wi-Fi-only tablets and another for those equipped with 4G? We will have to see how this turns out in the long term. Will Apple release a software fix for whatever is apparently causing the problems, or are hardware swap-outs the only real way to get to the bottom of a problem that has clearly got the attention of Apple? One thing we do know – there are apparently too many people suffering from Wi-Fi issues with their new iPad, for the whole thing to be in someone’s head!